If you forgot how to perform basic Hands-Only CPR, look no further. Here is a short video that shows anyone can go into sudden cardiac arrest (SCA) and collapse at any time. Make sure you know the steps to take in case of a SCA emergency. Step 2: Push hard and fast on the center of chest to perform Hands-Only CPR. 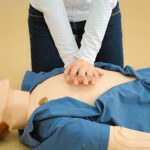 Performing CPR can restart an unconscious person’s heart, push blood back to the brain, and can help save a life. Learning CPR can give you the power to save a life! Please take a couple minutes out of your day to watch this short video on how to perform Hands-Only CPR. 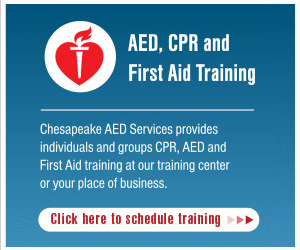 Feel free to contact Chesapeake AED Services with any questions regarding CPR or if you would like to schedule CPR training with us.